Hygienically Clean Napery in Commercial Laundering Operations verifies that Service Linen Supply has protocols, testing procedures and quality control measures in place to ensure the laundering process is capable of consistently removing potential pathogens or other unacceptable bacterial organisms from soiled napery. Service Linen Supply Napkins and tablecloths are NSF certified to be hygienically clean. 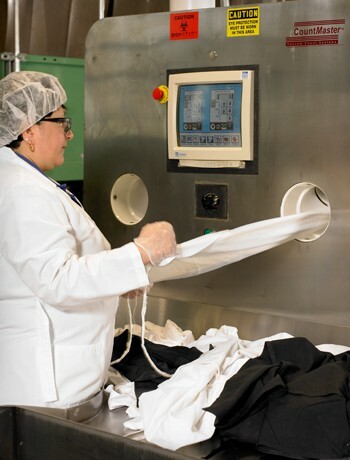 NSF certification verifies Service Linen Supply’s effectiveness in cleaning napery. Desk audit: Commercial laundering facilities are required to submit an organizational management system for review, which establishes the control points in the laundering process that are documented, monitored and audited. On-site facility audit: NSF auditors visit the laundering facility to ensure compliance with the certification program as well as the facility’s organizational management system. This includes on-site inspections of everything within the process from wash resources to the wash procedure to the handling of the final product. Product testing: Microbiological testing is conducted on samples of laundered products to confirm the repeatability and validity of the laundering facility’s effectiveness in removing harmful pathogens and bacteria.